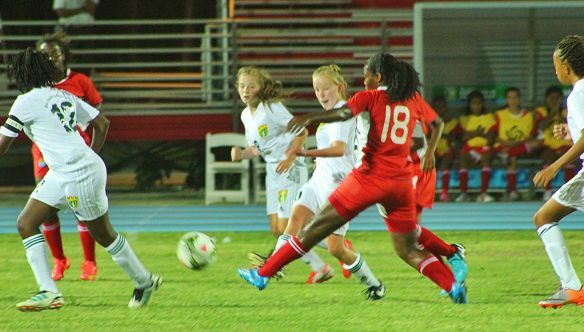 Saturday 9th August, 2014- The inaugural CONCACAF Under-15 Girls’ Championship kicked off Wednesday in the Cayman Islands, with the Virgin Islands facing the hosts in the Tournament Opener. In front of 1,100 fans at the Truman Bodden Sports Complex, Chelsea Green (15’, 25’, 30’) scored three goals to propel the host Cayman Islands to a 5-0 win over the Virgin Islands (VI). Green – a veteran of the 2014 CONCACAF Women’s Under-20 Championship – opened the scoring with a free kick that found the target from 25-yards out, while Sabrina Suberan (23’) made it 2-0 eight minutes later. Deondra Kelly (70’) completed the scoreline in the last minute. In their second Game played on Friday August 8th at the same venue, the VI Girls were unlucky to lose 2-1 to Curacao after Katie Lowery had put the Girls ahead in the 41st minute. The lead was short lived, though, as Lindsay Hart scored in the 46th and 50th minutes to give her team the win.